Designed for sniping, the Löwe is armed with the very accurate 10.5 cm KwK46 L/70 and paired with a rather decent hull. While not quite as heavily armored as the Pz.Kpfw. 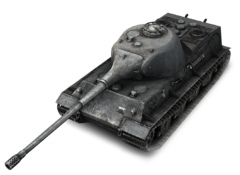 Tiger II, the tank's armor is sufficient to protect it from Tier 7 guns. The turret, however, is heavily sloped, allowing it to bounce even higher-tier guns on occasion. The performance of this tank is quite good for its tier, provided that it does not engage in close-quarters combat, which is almost certain death. It has poor acceleration, so any reversal in direction will take some time. As a premium tank, the Löwe produces a significantly higher credit income than a typical tier 8 tank. The Löwe was added in the 0.6.4. patch, along with the KV-5 heavy tank. Upper glacis isn't strong enough to resist guns with 200mm or higher penetration. "The Lion" is primarily a support tank. Do not use it to lead an attack. It will perform better when fighting from the rear of an attack group, from ambush, or from long range. It shoots accurately, and quickly. The Löwe suffers from classic German disadvantages: a tendency to easily suffer damage to the engine, and (often as a result) to light on fire. With a top speed of only 35 km/h, you might want to consider using high-octane Gasoline. Despite this, the Löwe is very maneuverable, or at least it is when on firm ground. The Löwe has earned a perhaps undeserved reputation for being piloted by bad players, due to new players buying it without proper previous experience in driving a heavy. Make no mistake — on the whole, the Löwe is an awesome weapon. However, it is quite difficult for it to fulfill its potential. Its armor is quite thin for a heavy tank and often even mediums or lower-tier heavies will be able to penetrate it. It is strongly advised that you get some experience piloting a Pz.Kpfw. VI Tiger before attempting to master the Löwe. Adding equipment will improve this tank's performance considerably. This page was last modified on 30 June 2016, at 22:46.